OMG Posters! » Archive "Yes We Did - Victory!" 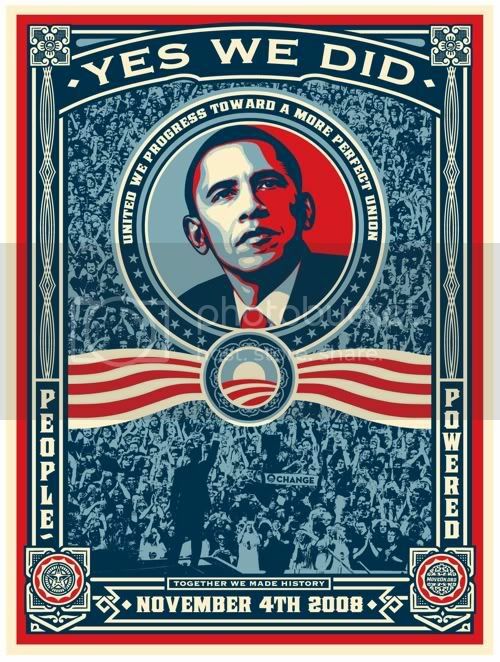 Obama Poster by Shepard Fairey (Updates) - OMG Posters! Ok, so here’s some more information on Shepard Fairey’s newest Obama print. “Yes We Did – Victory!” is available now in sticker form. You can either get one sticker for free, five for a $3 donation, or fifty for a $20 donation. Additionally, Moveon.org will release the image in poster form tomorrow. They will be numbered and limited to 5000 pieces. They will go up tomorrow (Friday, November 7) at 12:30 pm EST. Go HERE for the stickers and HERE for the poster. EDIT: The sale of the prints has been postponed, and will now take place tomorrow ( Saturday, November 8 ) at 12:30pm EST. FWIW I received my print today via UPS (6:19PM PST) and got number 1250/5000. I placed my order within two minutes of the order page appearing so I was the 250th person to place an order I’m guessing (the first 1000 being the signed ones). I recieved my poster today..haven’t yet opened to check the number. I was very very upset when Move.on relased an open addition the very next day………needless to say this is the last donation they’ll EVER get from me even though now they spam the heck out of me asking for money 2-3 times a day. We received our Numbered poster a few days ago, but, I’ve been sick so we didn’t open it ’til today. It’s just beautiful… and the stock it’s printed on is quality (meaning ‘heavy & thick’)… Absolutely worth framing under glass. We feel so fortunate to have been able to not only afford one of these Numbered posters (just couldn’t manage a Signed one for $500… so many medical expenses this year, *sigh*), but to also have the additional feeling that this Numbered poster gives us… My husband and I are very active politically, as I am sure most of you are here, and when we opened the package and unrolled the poster, we both just burst into tears all over again… it so took us back to all the hard work everyone has done to make Obama’s presidency a reality… and then to election night. We will treasure this poster always, and pass it on as an heirloom to our children, and their children, so they can, too, can behold a piece of our nation’s American History. For those who have expressed a feeling of being cheated because MoveOn is now selling UnSigned and UnNumbered posters at a discount, I wish to say this: Being a Collector myself, the Signed and/or Numbered posters will retain a much higher value than the UnSigned and/or UnNumbered posters printed on inferior stock. What you must keep in mind tho is ‘Provenance’. Keep all your records of the sale: your Credit Card receipt, the Email Confirmation, even the Email offering the poster to you from MoveOn. Print them out on acid-free paper, place them in acid-free sheet protectors, and put away for safe keeping. All these things will establish and maintain that what you have is the authentic, special, Limited Edition. We are proud to own this little piece of history. I hope you are too.